Mangaluru, Jan 19,2016 : The five day University youth festival - Jan 18-22, had a gala start. Girls from Sree Sankaracharya University of Sanskrit in Kalady in Kerala presented traditional dance forms of their State, students from the University of Mysore presented the traditional folk dance ‘pooja ‘kunita and ‘kharadi majalu’. 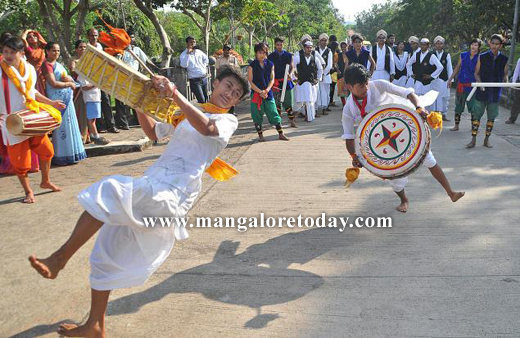 The students of Mangalore University showcased the art forms of Manipur. The highlights of a colourful march past that marked the beginning of a five-day South Zone Inter-university Youth Festival on the Mangalore University campus on Jan 18, Monday. As many as 30 teams from universities in Andhra Pradesh, Karnataka, Kerala, Tamil Nadu and Telangana are participating in the festival organised by Mangalore University and the Association of Indian Universities. Mangalore University’s Spandana team of students led the march that started from entrance of the university. The team comprising chende players danced all the way through the 800-metre long stretch of the road leading to Mangala Stadium, where the formal function was held. Following them were the members of Sree Sankaracharya University who attracted the attention of passersby with their presentation of Theyyam and other folk art forms of Kerala. The enthusiastic members of University of Mysuru team presented ‘dollu kunita’ and ‘pooja kunita’. Among other teams that took part in the march included Gandhigram Rural Institute Deemed University from Dindigul, Central University of Kerala, Karnatak University, Gulbarga University, Krishnadevaraya University in Ballari, Amrita Vidyalayam, Bangalore University, Jawaharhal Nehru Technical University, Hyderabad, Tumkur University, Kuvempu University, Krishna University in Andhra Pradesh and University of Agriculture Sciences, Dharawad. Inaugurating the event, Samson David, general secretary of the Association of Indian Universities, said that youth festivals were being held to promote national integration and communal harmony. Intercultural exchange would help build values which would foster tolerance. Absence of key people dogs event : Mangalore University Vice-Chancellor K. Byrappa was conspicuous by his absence at the inauguration of the five-day South Zone Inter-university Youth Festival on Jan 18 Monday. According to official sources, VC Byrappa is on a tour to the UK. T.P.M. Pakkala, Dean, Science faculty, had to discharge the role of Vice-Chancellor at the festival. There was disappointment among organisers about the absence of the VC as he had decided the date of the youth festival. Actor Prakash Rai could not make it for the inauguration. The actor called the organisers around noon to inform that he was down with fever and was not in a position to come.